Powered by IGT software, Nordic Heroes is a 5-reel, 30 pay-line game constituting eclectic online slot games that are appealing to a large audience of gamers. With an enchanting musical introduction and an interface inspired by the medieval times, players get to interact with Nordic Hero Thora in the Forest of Fortune. With this highly progressive slot game, players are assured of a breathtaking adventure in their quest for riches. In the quest to find riches on this IGT based platform, players are provided with a wide array of prize symbols to choose from in both Sea of Glory and Forest of Fortune. They include Eagles and Wolves that pay up to 250 coins, Thor-style hammers and Arrow tips that pay up to 500 coins and the mesmerising Thora and Ragnar that pays up to 1000 coins. Multiplier Reels And Bonus Features! What’s more about the prize symbols? Players can multiply them by use of the Mystery Multiplier Reel. Between levels 1 to 5, gamers’ prizes can be multiplied by up to 20x and for later levels up to 30x. One of the best symbols is the Bonus Shields and Sword. They award 2x your total bet when they appear on reels 1,3 and 5 which triggers the Battle Bonus Round. Nordic Heroes Has More To Offer! 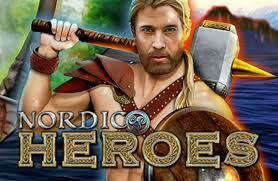 Nordic Heroes is an amazing online casino game that will entice a lot of players. This is because prizes are multiplied by your line-bet. What’s even remarkable is that you can play 1 to 30 coins per line! Gamers are sure to get an adrenaline surge like no other from the epic battles, wondrous adventures and a vast array of weapons to choose from. Brace yourself for an engaging game to cherish.